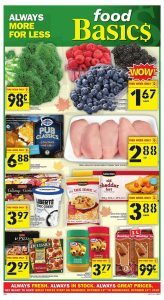 Food Basics Flyer Online Deals 21 Oct 2018 available to check here online. For a better and healthy life, you can check out all Food Basics fresh rayon. Prepare your own healthy salad today. Cheap and delicious fruits on sale now. Food Basics flyer contains good deals as always. Check out for daily deals and week of the deal. Click the image and get more satisfying prices. My favorite is fresh and skinless breast chicken family pack. For only this week it is on sale. You can combine this chicken with old cheddar fort. Put them to oven and create a new flavor. CLICK HERE TO SEE HALLOWEEN DEALS !! Halloween for less now. Discounted Lays chips and dairy products waiting for you. Let’s stock your favorites for Halloween. I am started to buy something my favorites. Selection potato chips croustilles really cheap in Food Basics Flyer Online Deals 21 Oct 2018. Enjoy your shopping, enjoy your Halloween.